It’s interesting that an Eastern European country that is as far north as Newfoundland has one of the most refreshing cold summer soups of any country in Europe. 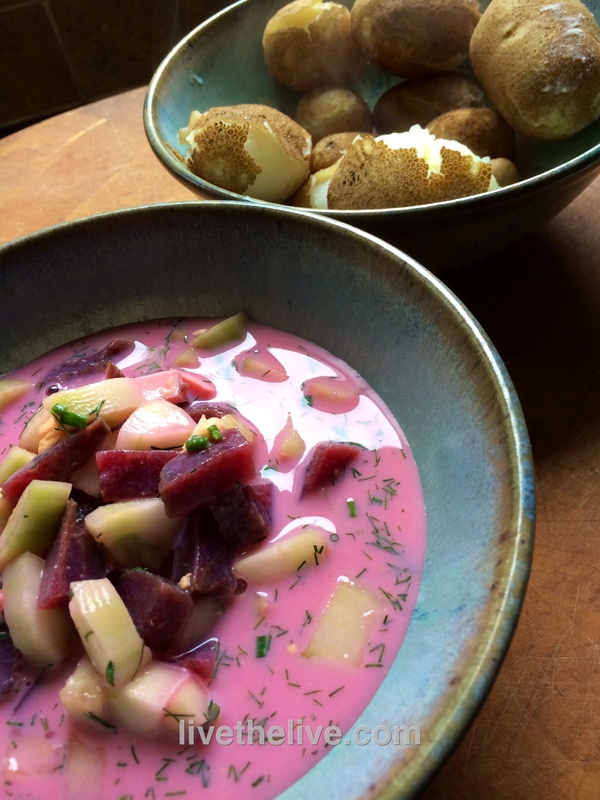 It’s a cold beet soup called Šaltibarščiai (pronounced shul-tih barsh-chay) and it’s classic Lithuanian cooking at its best. No summer was complete without my Mom’s Šaltibarščiai on the table, and my Dad always insisted on eating it with boiled potatoes on the side. Now residing in an assisted living facility, my Mom has not had this soup in many years, so I made her a batch when she came to visit recently. There are many different variations of this soup. For example, many Lithuanians today use keffir instead of buttermilk. My Mom insists this is a Russian influence and therefore not a good thing. I just think buttermilk tastes better. Pour the buttermilk into a large bowl. If it’s very thick, you can dilute it a bit with fresh water. Peel and chop the eggs and toss them in the bowl. Peel, seed and chop the cukes…then into the bowl. I love Love Beets, hermetically sealed cooked and peeled beets, ready to use, available in most supermarkets. (In the old days, my Mom would simply use canned beets.) I open a couple of packs of Love Beets, pouring the beet juice into the bowl. I chop the beets and add them as well. Grab some dill and chop it finely. Add it to the bowl. Finely chop the greens of one or two scallions and sprinkle some salt on them. Rub the salt into the scallions, mashing them a bit, softening them. Then add the to the bowl. Stir everything together, put a lid on the bowl, and let it chill in the fridge for a few hours. Remove from fridge, stir, and season with more salt if needed. Serve with boiled potatoes, if you like. Hahaha! My dad is the same. HAS to have potatoes on the side.